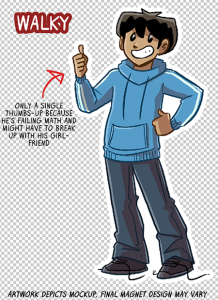 Next stretch goal for the Dumbing of Age Book 8 Kickstarter: Unlocking a free Dorothy magnet for everybody who pledged for mailable goods! The Dumbing of Age Book 8 Kickstarter has hit $45K! WALKY is unlocked! Go find the WALKY MAGNET tier if you want just him, or consider him for your PICK THREE or PICK FIVE MAGNETS tiers! And, of course, if you got COMPLETE MAGNET POWER, he is added to your pile. I’ve also added a WALKY AND JASON MAGNET tier, in case you want both of them together in an easily-selectable package. Up next is EVERYBODY* GETS A DOROTHY MAGNET at $50K. 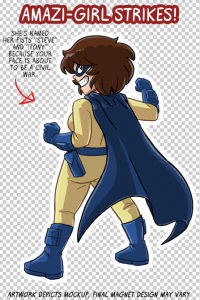 DUMBING OF AGE BOOK 8 KICKSTARTER UPDATE! 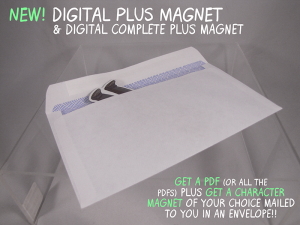 A new thing we’re trying out this year are the DIGITAL PLUS MAGNET and the DIGITAL COMPLETE PLUS MAGNET tiers! If you’ve ever wanted just a PDF instead of a book, but you also wanted a magnet, your time has finally come! After the campaign ends and I finish the PDF, you’ll get that emailed to you, but I’ll also be sending you an address survey, upon which you can tell me which of the character magnets you’d like mailed to you in a small envelope! And if the Dorothy magnet is unlocked by the campaign, you’ll receive her, too! Tier price includes shipping to anywhere in the world. We did it! 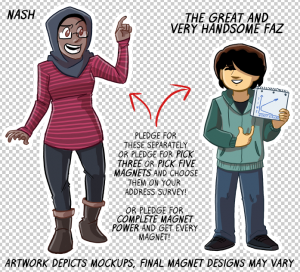 The Dumbing of Age Book 8 Kickstarter has hit its next stretch goal, so here are NASH – everyone’s favorite screwball over at Forest Quad – and FAZ – nobody’s favorite Amber’s little brother. You can pledge for them all by themselves, or you can grab either of the PICK THREE or PICK FIVE MAGNETS tiers and choose them to be in your squad after the surveys go out! And, as always, if you’ve pledged for COMPLETE MAGNET POWER, these have been added to your pile. The next stretch goal is unlocking RACHEL at $40! Not OTHER RACHEL, that’s a different person, but just plain ol’ RACHEL. And be on the lookout for other surprise reveals along the way! 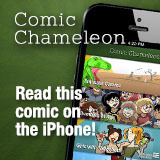 December’s second Patreon bonus strip is up, and it’s about FUCKFACE (the iguana)! All Patrons can go check it out this very second!